A seafront villa where al fresco living is king. With its numerous shady sea view terraces, splendid vistas of Mount Etna, direct access to the transparent blue waters from a jetty, and a panoramic outdoor plunge pool, Azzurra is a superb summer villa with the added bonus of being within walking distance of restaurants, cafés and shops in nearby Brucoli... unless you prefer to go by boat... Just let us know! Inside: the indoor living area is all arranged on one floor and communicates seamlessly with the numerous, elegant, covered terraces outside. The front door takes you into the main living area, with a little TV corner and a sitting area with comfortable sofas overlooking the sea. There is a big fireplace for the cooler months and large French windows leading outside. To the left is the indoor dining room and the lovely (smallish) kitchen, both of which have access to the terrace and to the outdoor dining areas. On the other side of the living room, a couple of steps lead up, past a guest WC, to the sleeping quarters, which comprise three comfortable bedrooms: a master bedroom with French windows, sea views and an en-suite shower room, a double-twin with en-suite shower room, and another double bedroom with en-suite shower room and French windows leading out to the beautiful lawned gardens. Outside: after passing through the gates, you enter the beautiful lawned gardens and catch your first glimpse of the elegant stone villa with its arched portico. The grounds surrounding the house are home to numerous shaded, breakfast and dining areas, each one suitable for a different time of day. There is even a sheltered dining alcove which is perfect for a game of cards or scrabble on a cooler night. On the other side of the house is the incredible seafront terrace, where you will probably spend most of your stay. To the left, outside the kitchen, is a large table under a shaded pergola, while just outside the living room is an al fresco living area furnished with comfortable and stylish sun loungers and chairs for the aperitif hour. Further along is the wonderful stone-built plunge pool with views of the bay of Brucoli and beautiful Mount Etna. Just behind the plunge pool is yet another shaded pergola. A flight of steps lead down from the terrace to the slipway and on to the sea gate from which you can access you a bathing platform and a jetty. Here there is a lounging area and a small manmade beach. A ladder at the end of the jetty makes accessing and exiting the transparent and blue waters of this sheltered bay easy. Last but not least is the underground garage, which houses a selection of canoes and kayaks for guests and direct access to the sea. Whilst there are perspex panes that protect the plunge pool terrace, the main outdoor area has some low walls and quite a few drops so children should be supervised by an adult when exploring the property. Azzurra is situated on the coast just outside the little fishing village of Brucoli, with its shops, restaurants and bars. It is well-placed for visiting nearby Siracusa, Noto and the surrounding nature reserves such as Cassibile and Vendicari. 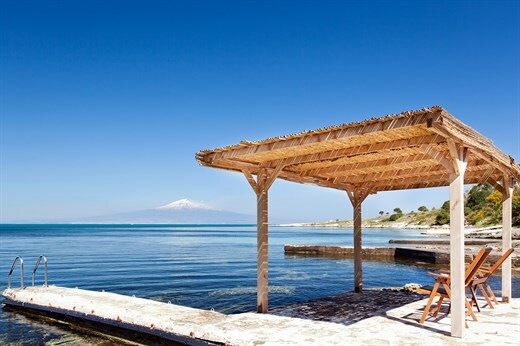 Slightly further afield, Taormina, Mount Etna and Ragusa are all good day trips, and a drive down to the southernmost tip of Sicily beyond Porto Palo di Capo Passero is highly recommended. Closest sandy beach – 45mins away to the south of Syracuse. Mount Etna: around a 1hr 25 drive depending on which part of the mountain you are heading for. "We had a perfect week at Azzurra. The setting is particularly exceptional. One cannot get tired of this view. The whole setup was great. Having kayaks to explore the sea was also very appreciated. " We loved Azzurra. The setting, the views, the maintenance, the amenities, water equipment, size and layout, location near Brucoli, etc. were all terrific. Azzurra is such a beautiful place to stay. Wonderful location and house, as it is indeed by the water. It was very helpful to have some water equipment like the kayaks. We stayed a lot at Azzurra and enjoyed every moment. We had a perfect week at Azzurra. The setting is particularly exceptional. One cannot get tired of this view. We also appreciated having an aperitivo ready for us when we got there after many hours of travelling. The whole setup of the villa was great. Having access to kayaks to explore the sea was also very appreciated. We really enjoyed having every meal outside: breakfast on the sofas, lunch by the sea dock and dinner at the round table. Azzurra was beautifully landscaped. Views outstanding. The house well set up for outdoor and water living. We really appreciated the use of kayaks, paddle boards, table tennis, tennis racquets. It made for a brilliant family holiday. Thank you to the whole team for an extraordinary vacation. You live up to every review ever given. Our holiday was a 10! Thank you! Azzurra is really an exceptional place with a fabulous location and great access to the water. The outside spaces (terraces and gardens) are lovely and well-tended. The rooms inside were very spacious and provided everything we needed. It was great to have the canoes, paddle boards and table tennis (and the tennis court so close). We loved Azzurra! It was fantastic. I and my family thoroughly enjoyed Azzurra!! We likely will book with you again if we return to Sicily. Azzurra was more spacious outside than it appears in the brochure and we particularly enjoyed sitting on our terrace admiring the view of Mount Etna, having long lunches, swimming in the sea and then getting into the hot Jacuzzi. The villa is absolutely wonderful. It was all very relaxing. Our villa was too nice to leave. We particularly enjoyed the wonderful views and to be so near and accessible to the beach. The in-villa cook was fantastic, 10 out of 10. The shopping delivery on our arrival again 10 out of 10, all done and put away for us, so nice rather than having to go out straight away to a supermarket. The villa was beautiful, the setting lovely. The house was also very clean and all the grounds well kept. We had a wonderful stay! We felt everything was very well organised and trustworthy and you really made everything possible to make sure we have all the necessary information to enjoy our holiday. The villa and experience was a dream - it was quality, brilliant, relaxing, memorable - all good words. We had a wonderful time with easy access to S/E Sicily. We ate in and out and the kitchen facilities were superb. All in all an excellent vacation. The best holiday we have ever had. We did not travel much - the villa was too wonderfully restful. How did we enjoy our holiday? 5 out of 5! Congratulations on everything! This has been my best experience in regards to advice and service in renting a villa... The villa and its beautiful setting is exceptional and we thoroughly enjoyed the grounds, views of Mount Etna and the gorgeous sunsets from the deck... Our holiday was truly memorable! I already have recommended Think Sicily to many friends. We enjoyed the villa and of course all the culture in this area. Our in-villa cook was just amazing and wonderful. Wonderful place... We were a party with ages ranging from 4 to 68 and we all had a fantastic time. We did a little bit of adventuring but were equally happy enjoying the villa and its surroundings... We would happily go back. Because the villa was set in the most spectacular surroundings we hardly left it! What an amazing villa and location! Villa superb. A fabulous holiday.